George Graham Reviews Frogel's "Busy Checking In"
There is certainly no shortage of jam bands around the country. They generally fall into a couple of schools, those that are primarily instrumental and improvisational, and those who start out with more structured songs, with lyrics that are more than just place-holders in their music. Last month, we featured one of the latter, the new solo album by the front-man of the group ALO, Zach Gill, who made a recording that featured worthwhile lyrics with jam band tendencies. This week we have another what I suppose could be called a semi-jam band, Frogleg, who present the kind of loose, good-time spirit of some jam bands with first-rate vocals and interesting lyrics. Their new second album is called Busy Checking In. Frogleg is an up-to-seven-piece self-described young band from Minneapolis. They did their first show in 2012, and released their debut album in 2015. They have been touring primarily in the upper Midwest, often sharing a bill with groups in the broad jam band and roots-rock categories. Their music has a kind of party atmosphere at times, and indeed some of their lyrics are relevant for that kind of thing, but they do put more effort into the songwriting, I think, than many of the emerging jam bands on the scene. One of their members is a saxophonist, and the album features some tracks with additional horn parts, and like many jam bands, they also have a percussionist in addition to their drummer. The group can be somewhat acoustic at times, with folky acoustic guitar and piano being prominent on the album. And though the band gets into some improvisation in sections of tunes on the album, with one exception there are no extended instrumental segments, and their emphasis is not on virtuosity. But instead, they concentrate on appealing music. One of the biggest factors in the Frogleg’s list of assets is lead vocalist Joe Dunn, who is also their principal songwriter. Their material ranges from folk-influenced to reggae to soul to roots rock. They keep a generally upbeat groove through most of the material, even the relatively slower songs. Busy Checking In, the new second release by the Minneapolis-based sort-of-jam-band Frogleg, is an enjoyable album that combines good songwriting with usually poetically vague lyrics with an easy-going groove that is often danceable. Their influences span roots-rock, folk, reggae, New Orleans, and old-fashioned soul. And they like to mix them up some. Unfortunately, our grade for sound quality is a C-Minus. The mix is well-balanced, but the recording was badly compressed and overdriven to the point of digital overloading on every track and on almost every drum beat. There is some irritating distortion frequenly heard on the vocals and instruments that take the lead. And of course, the recording has little dynamic range and the clarity is undermined by the ham-handed attempt to win some kind of imagined loudness war. 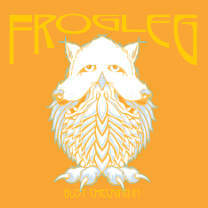 Frogleg on their second, more widely distributed recording has established themselves as a notable multifaceted contender on the jam band scene.